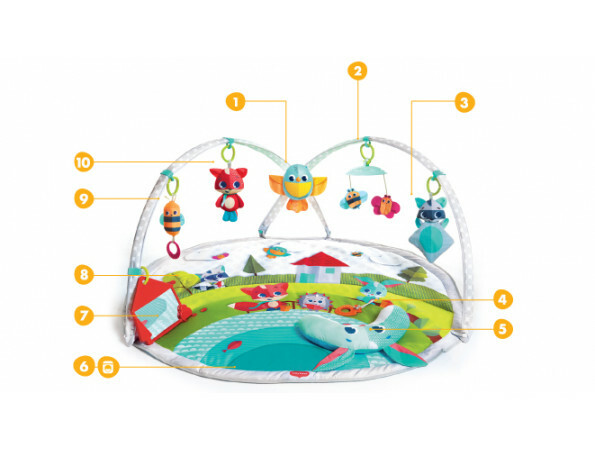 Uniquely versatile baby activity mat with adjustable moving arches that adapt to baby's age and stage, encouraging the development of fine and gross motor skills from day one. Please watch the product assembly video (third video in photo carousel) to maximize your enjoyment of the product and ensure a smooth transition between its various modes of use. 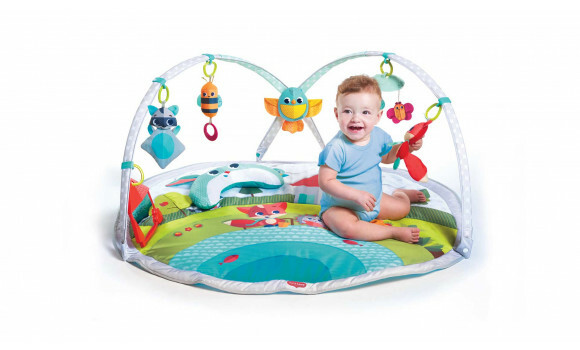 Open arches mode creates the ultimate space, allows easy access and encourage bonding time. 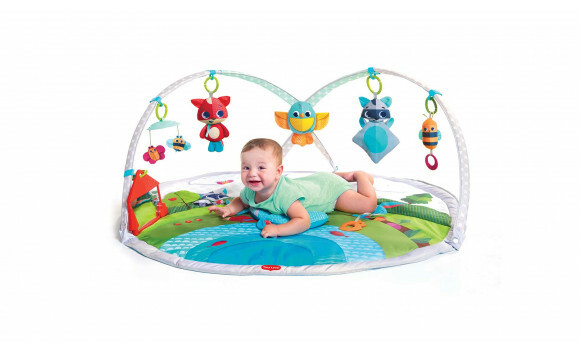 The wide mat offers baby plenty of room to roll around comfortably and, later on, sit up and play. 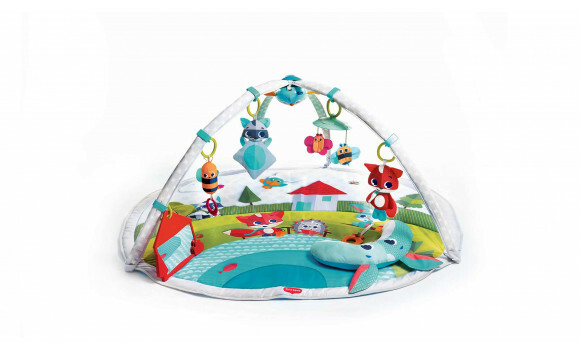 Fantastic games and activities: house mirror that doubles as picture frame, raccoon blanky, cloud mobile, tummy time pillow, wind chime, rattle doll and more. 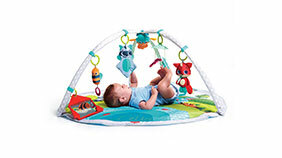 Baby-parent bonding is encouraged by the mat's unique design and comforting recording toy. 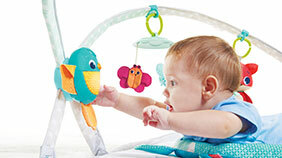 The uniquely designed recording toy encourages the development of language & communication. Baby hears words and sentences spoken in a familiar, loving voice while playing on the mat. 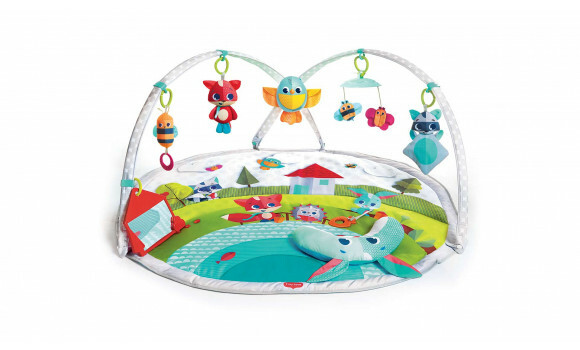 The spacious play area let’s babies stretch their bodies, experiment with movement and roll over, while the crinkly pillow, mirror and electronic recording bird help extend tummy time. 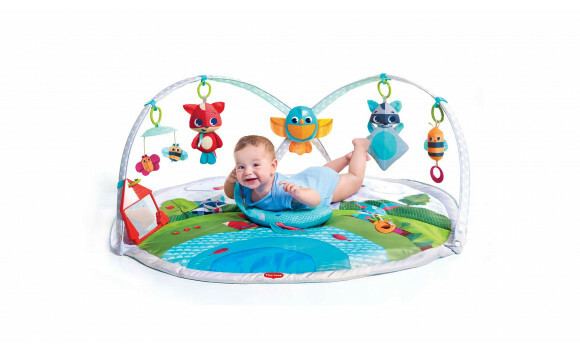 Lying on his back and tummy, baby practices grasping skills and develops hand control. 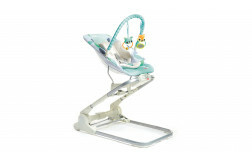 The Gymini® grows with baby and supports your little ones through their cognitive development. 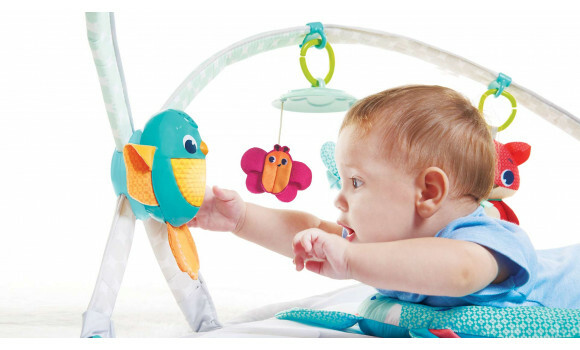 It helps them understand the idea of cause and effect through simple play in the first months and, as they grow, help them develop and learn with its more sophisticated features, like using the electronic bird toy to record their own voice. 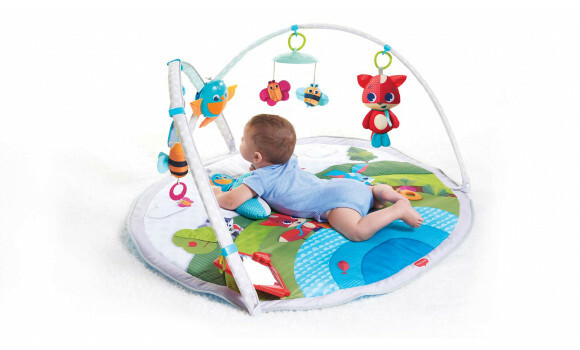 This special Gymini also encourages EQ, inspires Imagination & Creativity and stimulates the Senses. Just wanted to let you know that my Dynamic Gymini is one of the best gifts I received at my baby shower. Julia loves the colors and to know that she is building brain power is a bonus!